Prishtinë, November 16, 2018 – Financing new enterprises is one of the crucial elements in entrepreneurship ecosystem in the country. 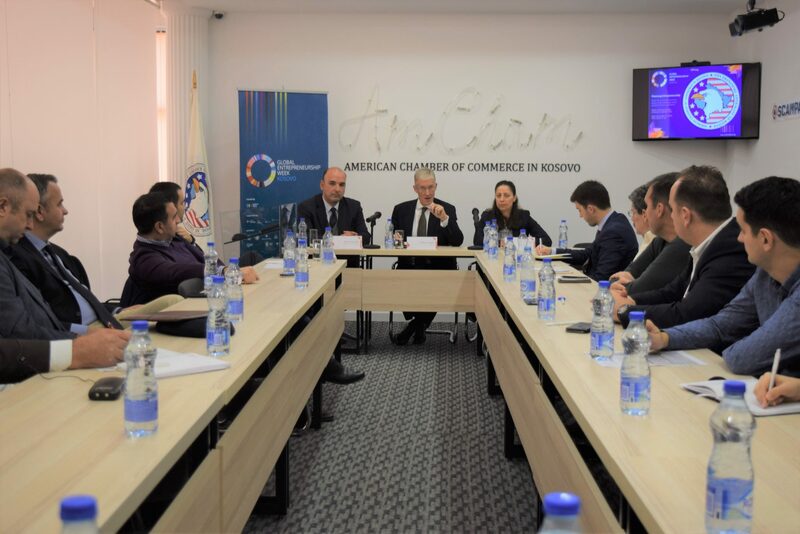 This was said during the roundtable organized by the American Chamber of Commerce in Kosovo during which were discussed available options for young entrepreneurs in financing their business ideas, and challenges they might face in this regard. Arian Zeka, AmCham Executive Director, said that this week aimed on emphasizing the importance of entrepreneurship in our society by discussing on various areas related to it. In this regard, he said that financing is a crucial element in entrepreneurship ecosystem and it is important in stimulating new enterprises in the country. Ramis Ahmetaj, Member of AmCham Board of Governors, said that Kosovo is lucky to have a stable banking sector which has resulted in private sector growth in the country. However, he added that the banking sector is not considered a financing source for new enterprises since banks manage individual deposits, and the risk on financing these enterprises is very high. Consequently, he said that financing through equity is seen as the best option for young entrepreneurs. Robert Wright, Executive Director of Raiffeisen Bank Kosovo, said that Kosovo has a great entrepreneurial spirit and this factor can contribute to the economic development in the country considering the high unemployment rate among youth in Kosovo. Wright said that new enterprises worldwide face challenges in financing, mentioning that entrepreneurs should be ready to take risks. Furthermore, he said that enterprises, besides being consolidated in the market, they should ensure that their organizational culture stimulates entrepreneurship within the company amongst employees. Eriola Bibolli, Deputy Executive Director at ProCredit Bank in Kosovo, said that the banking sector is always ready to finance and assist medium and small enterprises, innovation development, as well as the informative technology sector which is globally spreading. She added that the primary focus for the banks in the future is that the credit portfolio to SMEs to be oriented towards manufacturing and services sectors. Bibolli clarified that within the European Union there are various mechanisms that facilitate access to finance for small and medium enterprises, and that Kosovo is doing something similar through the Credit Guarantee Fund. Further on, participants in this discussion had the chance to discuss ways on creating financing mechanisms for new enterprises as a crucial step to developing the entrepreneurship ecosystem in the country.